Bailey begins by surveying the development of allegorical, historical-eschatological, aesthetic, and existential methods of interpretation. Though figures like Julicher, Jeremias, Dodd, Jones, and Via have made important advances, Bailey sees the need to go beyond them by combining an examination of the poetic structures of the parables with a better understanding of the Oriental culture that informs the text. 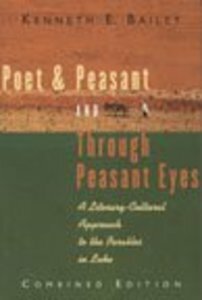 A definition of "Oriental exegesis"
About "Poet & Peasant/Through Peasant Eyes (Combined Edition)"
Kenneth E. Bailey (Th.D., Concordia Theological Seminary) is an author, lecturer and emeritus research professor of Middle Eastern New Testament studies for the Tantur Ecumenical Institute in Jerusalem. An ordained Presbyterian minister, he serves as Canon Theologian of the Diocese of Pittsburgh of the Episcopal Church, USA. He holds graduate degrees in Arabic language and literature, systematic theology, and New Testament. He also spent forty years living and teaching New Testament in Egypt, Lebanon, Jerusalem and Cyprus. He is the author of Jesus Through Middle Eastern Eyes (Intervarsity Press); Poet & Peasant (Eerdmans); Through Peasant Eyes (Eerdmans), and Finding the Lost: Cultural Keys to Luke 15 (Concordia). He is a popular contributor to BRF's Guidelines Bible reading notes.